Conformal coating inspection is a critical and often neglected stage of the conformal coating process. The standards such as IPC A 610 are explicit in their requirements for conformal coating inspection yet few companies actually inspect to that level. 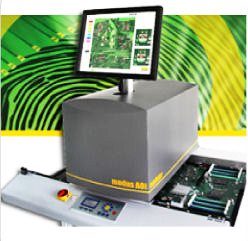 SCH Technologies are working as a partner with German company, Modus, to provide an automated conformal coating inspection system for automatic inspection of conformal coatings and defect detection. 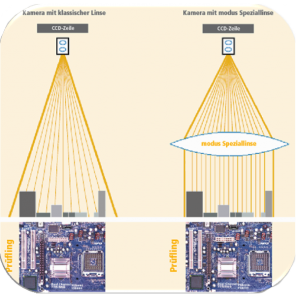 Modus have 25 years of experience with image processing being pioneers at developing scanner based industrial image processing systems. The solutions Modus provide today are complete software and hardware development from one source with specific long time experience in the automotive area. Modus have made unique technological advances in parallax-free image capturing for conformal coating processing. The Modus parallax free scanning system utilises a specialist lens which removes the parallax issues from the scanning process and eliminates shadows down the sides of high components. This combination of unique parallax free image formation with the right design of UV light ensures PARALLAX FREE conformal coating assessment without areas of shadow.